Parading beasts audition, each seeking to serve as companion to man. One by one passing before him, one by one rejected. His eyes to the heavens turn, sighing toward one bright spot. From her lofty home, Lilith looks on. Moved by his longing for her, she turns to the Maker. His eyes raise in wonder. His arms reach up to her. He thanks the Maker for this glowing bride. Reaching her orbit, she shines over him. He stands, with face uplifted, raising in equal measure sighs and lovers’ customary speech. Her affections shower down in rays onto his erect form. Under each night’s blanket, as all else sleeps, the two keep vigil, each enrapt in the other’s form. Nightly locked in a shared gaze, trapped in bodies that may never meet. She rests content above. Below, his longings multiply. But stars take less kindly to rejection than do mortals crawling upon the earth. Her stony heart remains unmoved. In sorrow, he beats his breast. In rage, he pulls his hair. In despair, he falls to the earth of which he is made. From the heavens, a reply, in a voice unlike his beloved’s. Awaking from a swoon, with a new ache in his side, he sees her form lying nearby. There is no blazing light. Her glory is of a lowlier sort, flesh and bones formed to suit his own. She will answer his desire. 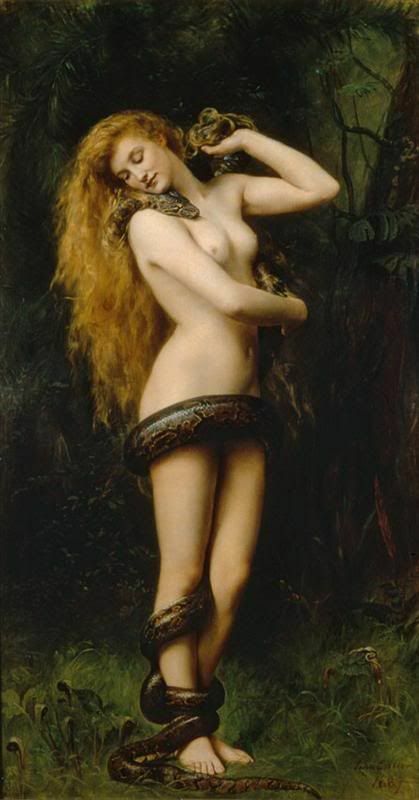 Above, Lilith looks on, unshining from her hidden space. She weeps at her fate, usurped by one of dirt made. To her sister she turns for comfort. Luna’s watching eye Terra’s form commands each night, as her ear is filled with her sister’s refrain. Day after day sisterly persuasion assaults. At last, she turns, but is unable to forego the sight of her beloved. Turning back, she notes her rival’s fierce blaze over Terra’s curve. Unwilling to leave, unable to bear the sight of her beloved’s love for another, she oscillates between Lilith’s taunts and Terra’s draw. The elder sister, in constant concealment from the eyes of Earth’s children, keeps watch over Luna’s eternal spin between two desires.